When you need emergency hydraulic repairs, preventative maintenance or onsite field servicing, call a trusted Australian hydraulics company to provide quality service and peace of mind. Pacific Hydraulics’ service vehicles bring the tools, spares and expert know-how necessary to start repairs immediately, and are dedicated to minimising your downtime, helping you get your operation back up and running as quickly as possible. As required, our field service vehicles can even remove larger components to be taken to our workshops for heavier duty repair work. Onsite diagnostic equipment to identify system issues. Offline filtration units capable of cleaning fluid to 3 micron or better, without having to shut down your operation. Range of replacement spares and seal kits for pumps and motors, especially Danfoss. Hose crimping and repairing equipment. Proper maintenance and testing of your hydraulic system helps minimise the chance of component failure, and promote the efficiency of your hydraulic system. Despite the best maintenance practices however, component failures may still occur, and the failure of a single pump, motor or valve can potentially bring your whole operation to a sudden halt. 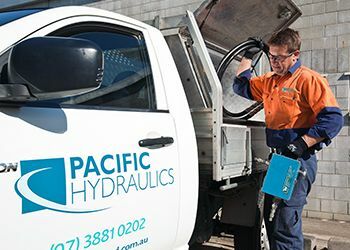 When hydraulic component failure occurs, Pacific Hydraulics’ emergency hydraulic repairs can help minimise the downtime, by bringing prompt, skilled mobile service technicians with the expertise and the tools to help get your hydraulic system back in operation. Our modern fleet of fully equipped service vehicles and skilled technicians come to you in an emergency, to diagnose faults and initiate repairs. With cross country capabilities, our service vehicles can get to hard to reach locations, or remote mine sites, ensuring your operation is within reach of hydraulic help in an emergency. Our mobile service technicians bring the expertise to be able to assist you in making the right choice for your conditions, whether it’s onsite repair, removal of the component for workshop repairs, or replacing the component onsite. We work with you to ensure minimal downtime and disturbance to your operation.